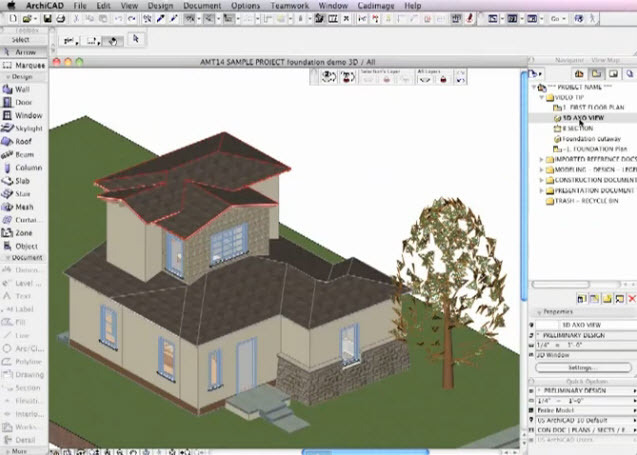 Welcome to CG Online Tutorials - This is ArchiCAD Modeling tutorial category web page and you can find link of a useful ArchiCAD modeling tutorials regarding Terrain Modeling using Solid Element Operations, hosted in other web sites. If you want to suggest a tutorial please do contact us, you can find our email address at the bottom of the web page. In this quick little 8 minute demonstration, I show how to work with terrain models using Solid Element Operations (SEO) and Complex Profiles to simplify, speed up and improve your construction documentation. There are some simple “tricks” in this video that may open your eyes to new possibilities! In the first project, a stem wall and footing system is modeled with a complex profile, then carved out from the terrain slab using an SEO subtraction. A crawl space is created by subtracting out a special slab from the terrain. This extra slab is on a layer that is viewed in wire-frame while working, then hidden once the operation is complete. The footing is extended wider by redefining the complex profile, with the results instantly seen in the section drawing. In a second file, the floor slab is used with an SEO “subtraction with upwards extrusion” to clear out the volume of the terrain mesh for the “slab on grade” and everything above (which includes the building shell and interior. A similar SEO is used to clear the space for the patio paving. In the final example, a path is created by drawing a slab using the magic wand to automatically trace an undulating outline created by two splines. The slab initially extends above the prevailing grade, but is cut down to match the grade using the SEO “intersect” option. The terrain mesh passes through the path slab, so it is modified by an SEO subtraction, which quickly results in a clean model. The relationship between the mesh and slab is active, so when the path boundary is moved, it still looks correct. The polygon boundary is then extended to show how this approach can be used for “color coding” different areas of the terrain for paving, planting or other uses. Please check it out and share your feedback here and also on the Facebook-style comments on the actual website page. Also, feel free to pass the word on to other users – I think this is something that many will benefit from.